I'm a NYC transplant who's proud to call Wayne County home. I moved in almost a year ago, and while I still unfortunately have to work in NYC, I can escape to the "free" side of the Delaware River whenever I need to. I was first introduced to the area about 6 years ago by a friend who lives up the road, and I liked it so much that I scrapped my original plans to take up residence in upstate NY and bought a home in PA; the passage of the NY UN-SAFE Act of 2013 definitely made my decision easier. I'm very much enjoying my new found freedom as a PA resident, and I look forward to joining the discussions here. Welcome to Pa.. nice screen name.. I guess you can succeed with a 0.0 gpa.. Thanks. Unlike my namesake, however, I didn't spend 7 years in college, and I never found myself on Double Secret Probation. 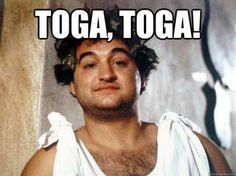 So what's first, Toga party or road trip? Count me in if your planning another parade..
Will do. Can you bring the marbles? There's a certain Amish moderator on here that can take care of the double secret probation for you. And welcome to PA and the forum. Thanks again, everyone. Do any of you hunt or shoot at the range at SGL 159? O/Ced Monroe County and Wayne & Pike !